Home > Design	> Cor-Ten Steel. What’s the Difference? It has a beautiful and natural rust finish which has a refined rustic look. It starts out looking like raw steel, but once cleaned of all oils, will quickly (within one month) take on a rust finish. The surface is ‘reactive’, so the rust finish is variable and changing. It’s core is non-corrosive, therefore it will withstand the elements without degrading like raw steel. It’s available as a sheet material in thicknesses of 3/16″ to 5″. In general, we have used Cor-Ten for planters, gates, railings, walls/retaining walls, and planting bed edging. Will it ‘drip’ rust and stain? Yes. Can I use it as a fountain? We haven’t. A lot of designers like this look for water features, and we’ve seen it used for fountains, but beware. Your water will most likely be brown and cloudy, and this can cause problems for your pumps. Is it more expensive? Yes, but worth it if you want it to last forever. If used for a planter, won’t the roots get too hot? Maybe. We’ve used bubble wrap or other filter fabrics to line our planters. It’s one of our favorite materials. Please share your stories with Cor-Ten. Is Cor ten weldable? Does It come in sq. tubing sizes? 2″ 3″ sq. tube .120 wall thickness? Yes, weld-able. You’ll need to check with a manufacturer on the tubing availability and wall thicknesses. Are you looking for a supplier or fabricator? 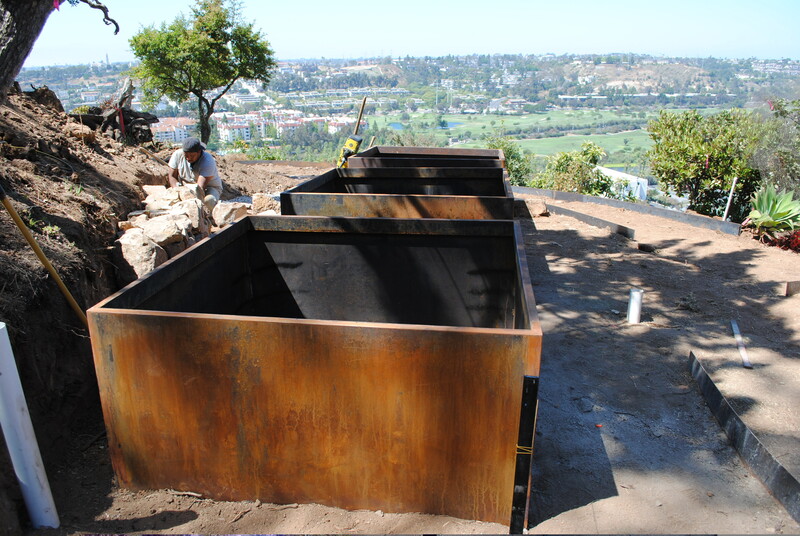 Hi, I am looking for a corten steel fabricator located in San Diego, any idea? thx! Call if you’d like to discuss your project! Great! Good luck with that. Let us know if you’re in the area. We’d be happy to discuss details.